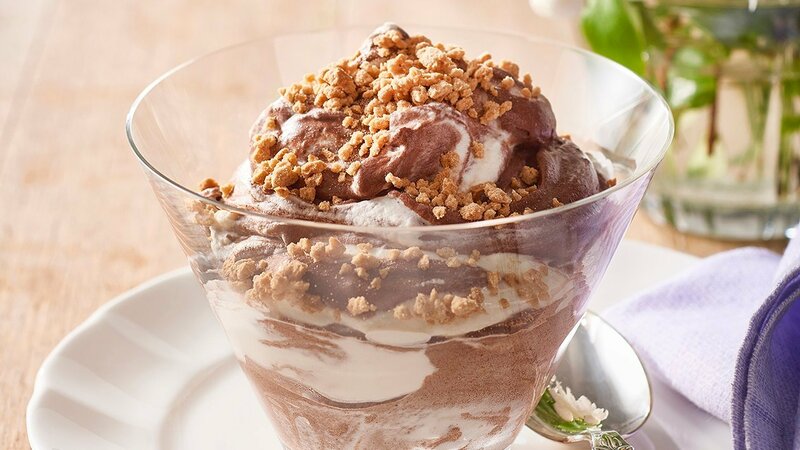 Inspired by Aussies' and Kiwis' favourite ice cream, this dessert creation is sure to delight your residents. The biscuit crumbs give it that nice crunch and texture. Whisk CARTE D'OR Chocolate Mousse Dessert Mix with the milk until thick. Refrigerate. Bring half the cream and sugar to the boil and whisk in CARTE D'OR Pannacotta Dessert Mix until thick. Allow to cool but not set. Whip the remaining cream and fold through the cooled pannacotta mix. Lightly fold through the chocolate mousse to create a swirl. Pour mixture into a large tray and refrigerate until set. Serve in individual portions sprinkled with biscuit crumbs. This dessert can present well in glasses as shown.